Second Shore is proud to announce the publication of the above work. For much of the past 50 years, Philip Bentley has had an involvement with the comic scene in Melbourne and Australia. From collecting Marvel comics in the 1960s, to attending early meetings of fans in the 1970s, being involved in publishing two seminal anthologies – Inkspots and Fox Comics – and in the establishment of Australia’s first comic shop –Minotaur, in the 1980s – Philip has lived a ‘life in comics’. In this engaging and candid memoir Philip reflects on these events within the context of the development of the medium in Australia and the world. Hence this is not a work not simply for those with an interest in comics, but for anyone with an interest in popular culture in general. It collects together chapters serialised in Word Balloons, now fully revised and with the addition of many more illustrations. Excerpts of the respective chapters can be found throughout this blog. It is a trade paperback sized, softcover of 125pp retailing for Au$25. Trade discounts on application. Available from Minotaur, All Star and the publisher via payment methods to right (under Word Balloons). Add $5 for post Australia-wide. Overseas postal rates on application. 'Comic books were one of the most popular, and yet most despised, forms of popular culture in Australia. Yet despite their often tumultuous history, the fascinating stories behind comic books in this country have largely gone unrecorded. 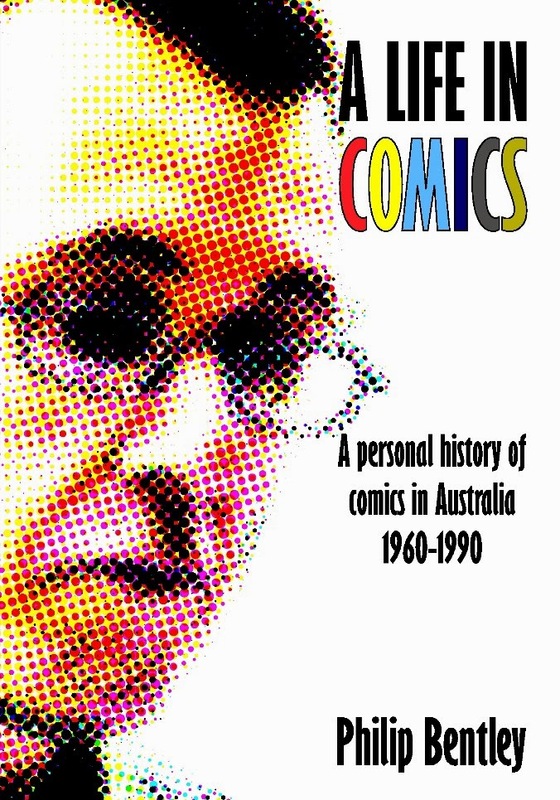 Overlooked by academics, the history of Australian comics has been largely documented by generations of fans, who have compiled informal histories of comic-book characters, their creators and publishers. Without their tireless efforts, our knowledge of this vibrant medium would be all the poorer. ‘Philip Bentley's A Life in Comics is a welcome contribution to this growing body of ‘fan scholarship’. Drawing on his longstanding involvement in Australian comics, Philip's work draws on his unique perspectives and experiences as a comics retailer, editor and publisher and, latterly, comics historian. His firsthand accounts of the ‘new wave’ Australian comics scene during the 1970s and 80s adds a much needed, and most welcome, chapter to the unfolding history of Australian comics.’ Kevin Patrick, Curator, “Heroes and Villains: Australian Comics and their Creators”, State Library of Victoria, 2006-2007. ‘Any culture worth its salt has its archetypes, its myths and ley-lines. Here, Philip Bentley breathes life into some of the great rivers that have fed comics culture in Melbourne. How can he do that? Simple. He was there.’ Bernard Caleo, Cartoonist and Editor Tango. 'Philip Bentley is in a big way responsible for making Melbourne the comics city that it is. Without Minotaur Books I doubt I would have made a career in comics, as where else would I have found them at the crucial juncture I did? I blame him for all that has happened since!’ Bruce Mutard, comic creator, The Sacrifice, The Silence.